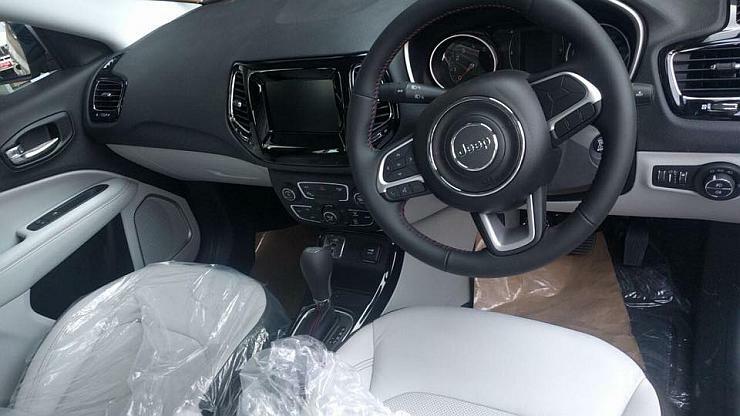 When Jeep launched the Compass two months ago, the company announced prices of both the diesel-manual and petrol-automatic versions. But deliveries of the petrol-automatic variants were to begin only from October. Now, a petrol-automatic version of the Compass has reached a dealership in Kerala. So, it appears that the customer deliveries of this vehicle will begin very soon. The Compass Petrol uses a 1.4 liter turbocharged engine with outputs of 160 Bhp and 250 Nm. This engine gets a 7 speed twin clutch automatic gearbox as well as a 6 speed manual. The automatic gearbox is offered on the Limited and Limited (O) variants, which are priced at 18.96 lakhs and 19.67 lakhs respectively. The petrol-manual combination is available only on the base Sport variant, priced at 15.16 lakhs. The Compass is turning out to be a big success for Jeep in India. The SUV is selling more than 2,000 units each month and this makes it the best selling car in Fiat Chrysler’s product portfolio in India. Jeep will also begin exporting the Compass to right-hand drive markets around the world. This should make it a very profitable option for the American SUV maker, and encourage it to bring more such mass market Jeeps to the Indian market. A new variant of the Compass is coming next year. It will be offered with the existing 2 liter turbocharged diesel engine paired with the 7 speed twin clutch automatic gearbox. This combination will attract a lot of buyers to the Compass because a diesel-automatic version allows them to have both performance as well as fuel efficiency, the latter being a missing point in the petrol-automatic version. The petrol-automatic version is mainly for those who have limited running, mainly on city roads. For such people, spending more on a diesel engine doesn’t make sense as fuel efficiency isn’t the main concern.